We are a CEREC, single-visit dentist office. 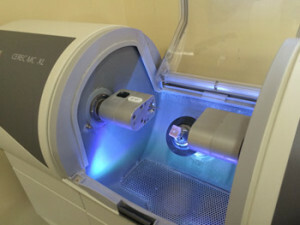 Using modern CEREC dental technology we are able to build durable, fully-customized, tooth-colored ceramic restorations and crowns right in our office. In a single visit, we are usually able to diagnose and prepare your damaged tooth, create a 3D impression of the tooth and create a new crown for you. This means no more multiple visits, much less discomfort and a significant time saver. Give us a call and ask about our CEREC crown technology or schedule an appointment to get your tooth fixed. We are happy to answer any questions you might have and can see if you might be ready for a single-visit CEREC crown.